Cushion-top conforms to your hand and helps reduce impact shock transfer. Designed to fit more comfortably in your hand. Cane strap with reflective patch for added night time safety. K-shaped quad base provides greater stability. Can be easily rotated to allow for left or right hand use without getting in the way. 11 individual height settings offer an unparalleled range of adjustments that fits most people 5′ – 6’5″. Cane height adjusts from 28″ to 39″. This simple, easy to use device attaches to a standard type cane allowing the cane to be suspended from any table, desk or flat horizontal surface. Actual product provided may not be exactly as illustrated. Manufactured from durable, high impact plastic. Protects cane from wear and tear. Helps to provide traction on most surfaces. Cane folds into 4 convenient parts for easy storage. 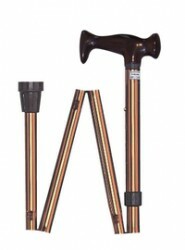 Lightweight adjustable canes have ergonomic wood handles and fold easily to take anywhere. Lightweight adjustable canes have ergonomic wood handles and fold easily to take anywhere. Handle height adjusts in 1″ increments from 33″ to 37″. Attractive wood handle with Aluminum color. 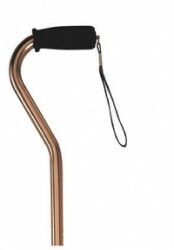 Height Adjustable Aluminum Offset Cane with Foam Grip. Lightweight Comfortable, durable. Easy-to-use, one-button with locking ring ensures added safety after adjustment and prevents rattling. Ergonomically designed handle with soft Foam Grip provides comfort and security. Handle height adjusts from 28 1/2″ to 38″. Comes standard with wrist strap. Manufactured with sturdy, 1″ diameter anodized, extruded aluminum tubing. Angle Adjustable Ergonomically designed contoured grip adjusts to fit the users wrist and hand. This can reduce stress on the users hands and joints. Offset handle design offers greater stability. Hand Grip can be rotated for left or right hand use. Easy-to-use, one-button height adjustment with locking ring. Height adjusts from 30″ to 39″. Available in chrome finish only. Comes standard with convenient wrist strap. Lightweight and adjustable canes. Comfortable, durable foam grip. Easy-to-use, one-button height adjustment with locking ring ensures added safety after adjustment and prevents rattling. 1″ diameter anodized extruded aluminum finish is sturdy, attractive and lightweight. Handle adjusts from 29″ – 38″. 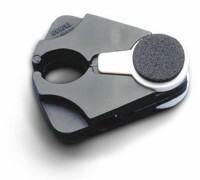 Easy-to-use, one-button height adjustment with locking ring ensures added safety after adjustment and prevents rattling. 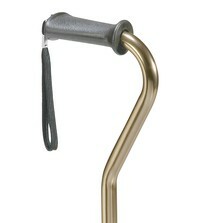 Height Adjustable Aluminum Cane with Anatomical Handle. Lightweight, comfortable and durable, this cane features easy-to-use one-button adjustments with a locking ring to ensure added safety and prevents rattling. Available in right and left handed handles. Ergonomically designed handle with anatomical grip provides comfort and security.